Dunfield House & Stables01544 230563work01544 231189fax Group HostelThe stables offers much more than stand alone self catering accommodation. With a well maintained kitchen and adjacent dining room, a very good ratio of showers and toilets to bunk style bed space along with unlimited hot water 24 hours a day makes this an ideal base for families, walkers, cyclists and friends getting together. Use of the extensive grounds of Dunfield House for football, volleyball, walks and relaxation is available. A campfire site, indoor heated swimming pool and games room can be used by prior arrangement. Don't fancy cooking? A catered option for one or more meals is available by prior arrangement. 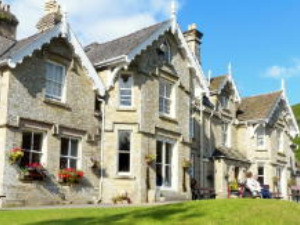 Sleeping 70 and offering a catered service with highly recommended home cooked food, Dunfield House offers bunk accommodation, hot showers and excellent lounges and meeting rooms for families, youth, church and friends for education, music courses, training, relaxation or celebration. Both the house & stables have commendable standards of housekeeping. The stables offers much more than stand alone self catering accommodation. With a well maintained kitchen and adjacent dining room, a very good ratio of showers and toilets to bunk style bed space along with unlimited hot water 24 hours a day makes this an ideal base for families, walkers, cyclists and friends getting together. Use of the extensive grounds of Dunfield House for football, volleyball, walks and relaxation is available. A campfire site, indoor heated swimming pool and games room can be used by prior arrangement. Don't fancy cooking? A catered option for one or more meals is available by prior arrangement. Sue & Paul [house managers] live onsite and are available to offer their personal attention from your initial enquiry through to and during your visit. Exploration of Herefordshire and Powys offers a variety of activities for all ages. Walks from Dunfield and the surrounding area afford the opportunity for people of all abilities and standards to access stunning views away from the crowds. For further information please do not hesitate to contact Sue & Paul. The Stables and Dunfield are situated on the A44 two miles west of Kington, Herefordshire. Take a right turn [Dunfield Lane] turn right turn over the cattle grid.